In less than a week, the new Spider-Man game – from Ratchet & Clank and Sunset Overdrive developer Insomniac Games – is out exclusively on the PS4. It’s been a while since we had a standalone open-world title for the famous web-slinger; the last one was in 2014 in fact, which was a movie tie-in and looks super dated already. Marvel’s Spider-Man, as the upcoming one is officially called, is set to tell an original story following Peter Parker, and involves over a dozen supporting characters and supervillains, including Mary Jane Watson, Aunt May, Norman Osborn, Mister Negative, Kingpin, and Vulture among others. Spider-Man is out Friday, September 7 worldwide. There’s a total of four editions available:. Spidey Suit Pack with three suits. Five Skill Points to unlock abilities from the start of the game. Early Unlock of a Spider-Drone Gadget. Spider-Man PS4 White Spider Avatar. This is available both at retail and digitally. In addition to the base game, this includes access to downloadable content (DLC) known as The City That Never Sleeps. Pre-ordering gets you the same aforementioned benefits. This is only available digitally. Pre-ordering gets you the same benefits as other editions. This is only available at retail. Pre-orders carry the same benefits as other editions. It is only available at retail. This edition has already sold out in India, US, and Europe. Spider-Man: Rs. 3999 at PlayStation Store, Amazon, Flipkart, or GamesTheShop. In the US, Spider-Man costs $60. Spider-Man Digital Deluxe Edition: Rs. 4,999 in India and $80 in the US. Spider-Man: The City That Never Sleeps DLC costs $25 on its own in the US – it has yet to be listed in India – so you can save $5 with the Digital Deluxe Edition. 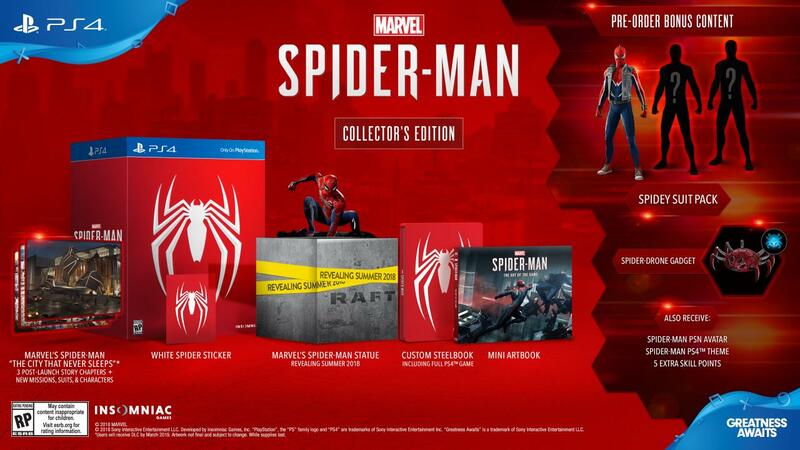 Spider-Man Collector’s Edition: Rs. 9,999 in India and $150 in the US. As we said before, it’s out of stock here and it looks unlikely Sony will import more units. Spider-Man: The City That Never Sleeps DLC will have a total of three chapters. The first chapter ‘The Heist’ will introduce Black Cat aka Felicia Hardy in the flesh, and will be out October 23, followed by Spider-Man: Turf Wars in November and Spider-Man: Silver Lining in December. All three will feature new missions, challenges, new enemies free and/or new suits. If you plan to buy Spider-Man digitally, you’re looking at a 47GB download. 60fps enthusiasts, look away. On both the standard PS4 and PS4 Pro, Spider-Man will run at 30fps. 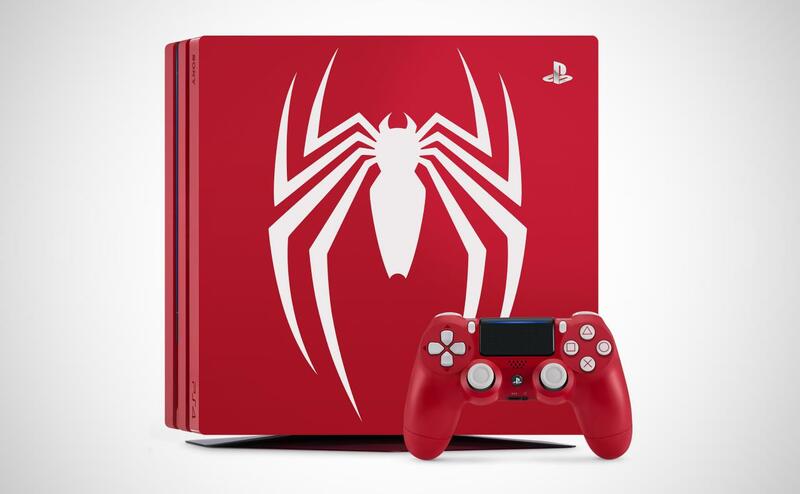 For those who are yet to buy a PS4 or PS4 Pro, Sony is introducing a limited-edition Marvel’s Spider-Man variant of both consoles. They come in red and have a white Spider-Man logo on the top, while the packaged DualShock 4 controller is also in red with white buttons and thumb sticks, and a black touchpad, as you can see in the attached picture. You get 1TB of storage and complimentary access to the base game and DLC. The Spider-Man PS4 retails at $300 (about Rs. 21,300) while the Spider-Man PS4 Pro comes in at $400 (around 28,400). Neither of them has an India availability yet.